This entry was posted on December 12th, 2014 at 8:30 am and is filed under Podcast. You can follow any responses to this entry through the RSS 2.0 feed. You can leave a response, or trackback from your own site. Thanks for the shout-out, gents; your podcast is a real gem. Have you ever covered Button Gwinnett, who signed the Declaration of Independence? His signature, of which there are only 51 copies, is very valuable. They say that’s only because it’s rare, but, Ken and Robin, what mystical powers might it have, and why might the players need to get a copy from a museum or private collector? I’m guessing you recently caught the Radiolab podast which covered the case of Button Gwinnett. Just FYI — this is how I heard about Weird Detective. 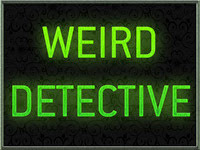 I am disappointed that the Weird Detective ad made no references to electric pentacles. You could have Gurdjieff’s “waking sleep” concept be a fake out, and what’s really important is his musical background, linking to a mute German viol player now living in the Rue d’Auseil. Another great show – thank you gentlemen! One interesting Dali connection is his relationship to Marx! No not Karl, but rather the really funny one, Harpo. This is just betting to be adopted into a “Shadows Over Filmland” scenario. What advice would you offer players who are taking on the role of established historical and cultural figures, who might be nervous about portraying the person “wrong”? “Oh, listen to me, I’m all Canadian, don’t write too much about NPCs”” .. says the man who wrote THREE FRICKING PAGES on André Breton – you muppet! This is turning into one of those movies where the dummy takes over the ventriloquist, isn’t it? Has Robin seen Laurie King’s _The Bones of Paris_ — a mystery set in 1929 Paris. Cameos by various figures, a larger part for Man Ray, and lots about the Grand-Guignol. Good atmosphere. “It can all lead to, or from, Derrida.” That sentence costs me 1d4 SAN, as I flashed back to my abortive attempt at a master’s degree in English. The effort of wrapping my head around Derrida enough to engage him on his own terms (or close enough to satisfy my professor) forced me to deconstruct my own motivation as a graduate student.